ReproLife™ is a new medium optimized for the culture of Normal Human Female Reproductive Epithelial Cells, including: Endometrial (Uterine) Epithelial Cells, Fallopian Tube Epithelial Cells, and Vaginal Epithelial Cells. ReproLife™ supports the growth of these cells over a period of at least 5 population doublings. ReproLife™ Basal Medium contains no antimicrobials and no phenol red. Lifeline® offers antimicrobials and phenol red, but they are not required for eukaryotic cell proliferation. 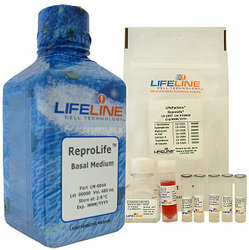 ReproLife™ is offered in a kit format composed of basal medium and associated supplements and growth factors called “LifeFactors®.” This kit allows preparation of fresh medium in your laboratory, extending shelf life and enhancing performance. ReproLife™ Basal Medium is provided in a light-protected 500 mL bottle. The remaining LifeFactors® are packaged in a convenient gas-impermeable pouch for easy storage. Lifeline® incorporates ISO-style quality assurance in every production run. Exacting standards and prodution procedures ensure lot-to-lot consistency. Every production lot of ReproLife™ Medium is extensively tested using Human Female Reproductive Epithelial Cells. ReproLife™ and Gentamicin-Amphotericin are cell culture tested separately. ReproLife™ grows Normal Human Female Reproductive Epithelial Cells — including Endometrial (Uterine) Epithelial Cells, and Vaginal Epithelial Cells — through at least 5 population doublings, while maintaining excellent cell morphology.